Dear Colleagues, the request below will be emailed to all Labour MP’s in London asking them to sign up to EDM 1188 which calls for a full debate on the new regulations around the NHS & Social Care Bill. That an humble Address be presented to Her Majesty, praying that the National Health Service (Procurement, Patient Choice and Competition) (No. 2) Regulations 2013 (S.I., 2013, No. 500), dated 6 March 2013, a copy of which was laid before this House on 11 March, be annulled. 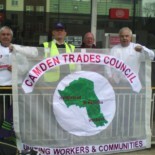 This entry was posted on March 19, 2013 by CAMDEN TRADES COUNCIL.